There are quite a lot of pubs incorporating the name “Castle”, either that on its own or appended to the name of a place.1 One presumes the popularity of the name — the idea of the “castle” — comes from it being a fortress against the outside world, the province of lords and kings, an unreconstructed masculine space exerting authority over the world, not to mention a scene of carousing. I’m guessing at this, of course. Figure 31. 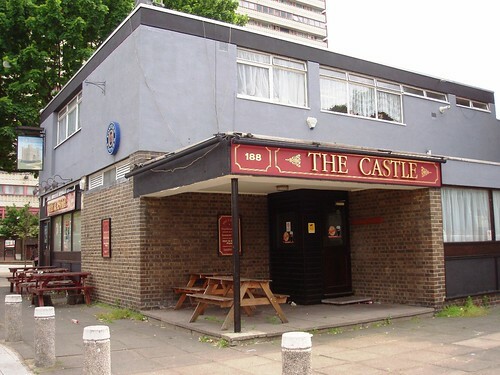 The Castle (Camberwell SE5), now closed. Perhaps this is also the reason there don’t seem to be quite so many really nice pubs by that name any more. In fact, a lot of my examples seem to be closed or renamed, though admittedly there are still a lot of pubs by that name I haven’t collected photographs of, which may disprove that perceived trend. A representative example of this may be The Castle (Camberwell SE5, now closed, fig. 31), where the name is an almost desperate bid by an estate pub to latch onto some grandeur in a egregiously run-down part of town. Its sign is a particularly fine example of wishful thinking. My conceptual imagining of the meaning behind the “castle” extends to places named after a local street or area, the pub thus becoming the metaphoric castle ruling over that area, the modern equivalent of that mediaeval stronghold. So we have The Holloway Castle (now The Castle Bar, just off Holloway Road, Lower Holloway, N7), The Alwyne Castle (now The Alwyne, near Alwyne Square, Canonbury N1), or The Dover Castle (on Great Dover Street, Borough, SE1) — the latter also doubling as a real castle popular in pub names. Where a specific castle is mentioned, there may be a more complicated origin. 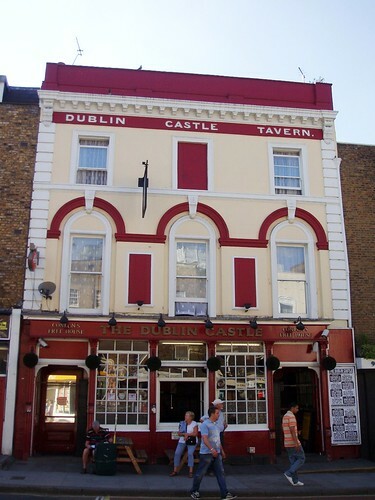 For example, The Dublin Castle (Camden Town NW1, fig. 32) may at first glance suggest the nationality of an earlier wave of immigrants to the area, surviving in several other Irish pubs nearby and throughout North-West London. However, a more interesting history lies behind it, as it was built during a period of intense railway construction — Camden Town lies just behind the major London termini of Euston, St Pancras and King’s Cross, where their many lines intersect and run through tunnels to the North — and the construction workers (navvies), sourced from all over the United Kingdom, were prone to factionalism. Hence the Dublin Castle served the Irish workers, while other pubs were built in other parts of the area (but not too close by) for the rest of the navvies. Thus there’s The Edinboro Castle (Camden Town NW1) for the Scots, as well as a Windsor Castle for the English and a Pembroke Castle for the Welsh. Figure 32. The Dublin Castle (Camden Town NW1), undoubtedly to be encountered again in a later entry on music pubs. References to royal castles, however, can suggest royalist sympathies amongst the drinkers, though these are perhaps not so strong now as in the past. There are plenty of Windsor Castles and even a (former) Balmoral Castle (now Kennedy’s, Lower Holloway N7). But quite why such castles as Eastnor Castle (Somers Town NW1)3 or Thornbury Castle (Marylebone W1) are referenced in the names of pubs is a bit less obvious. One can only assume the original publican came from those respective parts of the country (Herefordshire and Gloucestershire in the examples given). History again informs the naming of Jack Straw’s Castle (Hampstead NW3, fig. 33), a former pub dominating the north-western corner of Hampstead Heath. Jack Straw was a fourteenth-century leader of the Peasant’s Revolt who was reputed to have fomented rebel sentiment by addressing groups on the local Heath.5 You won’t see much of that kind of behaviour in modern Hampstead, but then again nor are you likely to be able to take a drink in the pub that bears his name. Like many of the pictured examples, the modern “castle” is no longer a pub, but residential accommodation. The metaphorical has become literal: a man’s home is still his local pub. Figure 33. 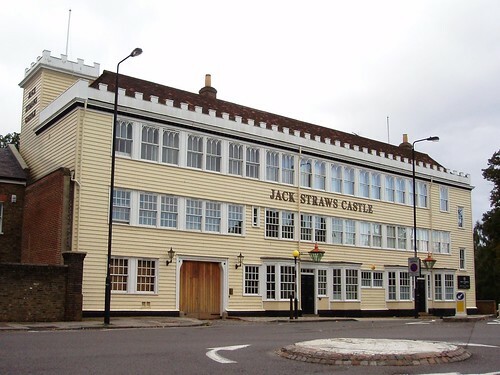 Jack Straw’s Castle (Hampstead NW3). See also: Search for pubs featuring the name “Castle” on my Flickr stream. This is quite apart from places called “The Elephant and Castle”, which I have no intention of discussing, nor of getting into the various possible etymologies of that name, most of them largely apocryphal. There’s certainly no persuasive evidence of the popular ‘Infanta y Castilla’ corruption. See the Wikipedia entry. It was destroyed in the Great Fire of London, 1666. See Wikipedia entry. It’s not even a real castle, but a 19th century impostor. For the Thornbury Castle, here’s a Wikipedia entry as well. You can see where I do a lot of my research, but I do have books as well. See Wikipedia entry, an attractive looking place, unlike the pub off Marylebone Road, a thoroughfare rarely described as particularly beautiful or pristine. This entry was posted in Pub Names and tagged pub names. Bookmark the permalink. The Castle on Camberwell Church Street (pictured at the bottom of the main photo) is a far more pleasant Camberwell Castle than the Castle on Camberwell Road. I can give you a full and detailed history of Thornbury Castle! It was where Nigel Slater had his first professional kitchen job. I grew up within a stone’s throw. Oh and also the Wikipedia entry doesn’t mention its star polygonated oriels. If a pub had those, I would be impressed. This pub is the ‘South East London Muslim Centre’ now. Sorry about that vague post – meant to refer to the Castle pub at Castlemeade on Camberwell Road. Another victim of pub companies and property developers making money by asset stripping the nation of its heritage, history and tradition. What’s happening to the UK is a serious, unprecedented cultural crime that is leaving deep scars on communities all over the country and on the physical landscape. As a keen user of pubs in Camden I have always been intrigued by the tale of the 4 ‘castle’ pubs mentioned above being intended to keep the navvies apart. And have always been extremely dubious for numerous reasons. So with the help of the Camden History Society I’m trying to research it to find out if it is actually true or not. Can I ask if you’ve seen it documented anywhere? Or have you just picked it up from hearsay and other blogs? It is a great story, but I’d really like to get to the bottom of it. I think you’re right to be sceptical. I can’t really find much reference to it in any of the more dependable resources, so it’s probably from rather more anecdotal sources I imagine (and as you no doubt are aware, a lot of pub discussion is of this nature). Still, there definitely were pubs by these names in the general area, and they may date back to the 1830s or earlier, but whether this is the reason for their names, I can’t be sure! Thanks Ewan, I’m dubious for several reasons. Firstly, the theory doesn’t make sense. It would stop fights and it would keep the nationalites separate. It doesn’t mention what would stop them going to any of the numerous pubs in the area, and indeed omits to mention the other 5 or 6 Castle pubs in Camden Town at the time! But more convincingly the dates don’t tally up for it to work. All four pubs would have to have been built at same time as each other. And at the same time as the railways (Just taking into the account the 3 major mainline construction periods). Windsor Castle & Pembroke Castle both opened at some point between 1851-1869 (trying to narrow this down). So basically, 3 of the pubs missed out on the first line being built, and only Irish navvies would have been able to slake their thirst free from fights. The English and Welsh navvies on the Great Northen Railway very probably wouldn’t have their respective pubs built yet. And just possibly neither would the same navvies working on Midland Railway! and finally got the bravery to go ahead and give you a shout out from Porter Texas!